Spending the summer on an icefield may not be the ideal vacation for most people, but for researchers from around the world, it’s the opportunity of a lifetime. Each year in July and August, 40 to 50 professors, scientists, and students travel to Alaska for the Juneau Icefield Research Program (JIRP), the longest continuous research study of a glacial system in the Western Hemisphere. Located near Juneau in southeast Alaska, the icefield—the fifth largest in the Western Hemisphere—covers approximately 4,400 square km (1,700 square miles) and feeds 35 large glaciers, including the Mendenhall and Taku glaciers. JIRP and its parent organization, the Foundation for Glacier and Environmental Research (FGER) based in Seattle, Washington, grew out of research first conducted on the Juneau Icefield in 1946 by Dr. Maynard Miller. The mission then, as now, is to understand the dynamics of glacier systems as they relate to climate change. Central to this understanding is the measurement and monitoring of glacier velocities and surface elevation changes using high-precision GPS/GNSS. Tracking these changes through time allows scientists to gain key insights into climate change. In 1981, the University of German Armed Forces, the Technical University of Munich, and the Bavarian Office for Surveying and Geoinformation started collaborating with JIRP by sending their own geodesists and equipment to provide support for the many interrelated disciplines represented on the icefield: geology, glaciology, geophysics, botany, hydrology, meteorology, remote sensing, cartography, and geoinformatics. Last summer, both new and veteran researchers participated in the program. 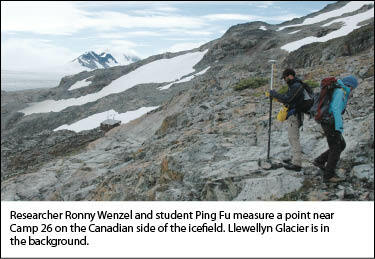 Although JIRP has used GPS since 1992, the 2010 field season saw the first use of GNSS gear on the Juneau Icefield. While the Juneau Icefield has been studied in detail since 1946, the ways in which it has been measured have constantly changed and improved. For the first 40 years, measuring positions on the ice relied on optical observations using theodolites. The emergence of total stations in the 1980s improved results significantly, but the optical methods were still limited by instrument range, extreme refraction over the glacier surface, and the frequently poor weather conditions. This changed in 1992 when researchers began using GPS receivers. Since then, GPS and GNSS have become the enabling technology for increasingly thorough and accurate scientific research in the quest to understand the complex dynamics of the Juneau Icefield. Such understanding requires fundamental information about the mass balance (the difference between the amount of snow and ice accumulating on the glaciers and the amount lost to melting, evaporation, and sublimation). Other key information includes depth and temperature of the ice, meteorological conditions, surface velocity vectors, strain rates, surface gradients, and changes in the surface elevation. While Juneau offers easy access to supplies and air transit, the research takes place in remote alpine sub-polar areas accessible only by helicopter, hiking, or skiing. After arriving in Juneau last summer, the JIRP survey team faced an eight-day weather delay, which prevented delivery of essential GNSS equipment to the main base. Once on the icefield, travel is by snowmobile, skis, or on foot. Survey teams can cover up to 80 km (50 mi) a day, with temperatures ranging from -10º C to +15º C (14º to 59º F) and conditions as diverse as sunshine, rain, fog, and snow. Wind speeds in excess of 100 km/hr (62 mph) are not unusual. Accommodations are in FGER-installed buildings firmly anchored to bedrock outcrops. These camps typically feature generators for electricity, kitchens, library, sleeping quarters, and classrooms. Occasionally, research teams sleep in tents when their work requires overnight stays on the glacier. The use of GPS/GNSS equipment was essential to the survey team’s success. Used extensively were Trimble 5700 GPS and Trimble R7 and R7 GNSS Receivers, with Trimble TSC1 and TSC2 Controllers running Trimble Survey Controller Software for the static and RTK measurements. In camp, the surveyors used Trimble Geomatics Office and Bernese GPS software to process and analyze the GPS/GNSS data. 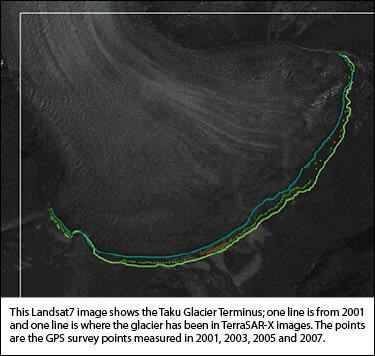 Microsoft Excel, ESRI ArcGIS, and MATLAB software were used for analysis of movement and changes in the glacier. During July and August of 2010, JIRP participants worked together as a multi-disciplinary team, with surveyors playing a key role in the overall research efforts. Surveyors concentrated on geodetic work as well as supporting the other disciplines by providing GPS positioning information. However, the bulk of the surveyor’s activity was focused on collecting data from longitudinal and transverse profiles on the glaciers to determine the icefield’s annual height changes. On a typical day, the surveyors would leave camp around 9:30 a.m. to set up the base station over an established benchmark. This base station would then support RTK surveys for two rover teams, each of which would survey a nearby profile by navigating to within 50 cm of the profile’s stakeout points that were uploaded to the rover system the night before. The navigated-to position was then recorded on the rover. Glacier velocity surveys required measuring the surveyed point a second time, so when the point was measured the first time, a bamboo wand was stuck in the snow at the exact measured point. This allowed the measured point to be re-occupied and measured a second time some 5 to 10 days later. Each rover team could typically measure 40 to 60 points over the course of 6 to 10 hours before returning to camp between 6:00 and 8:00 p.m. They then used the evening hours to recharge batteries using the camp generator (which was also needed for evening lectures), download the day’s data, and upload profile stakeout points for the next day’s work. “Lights out” was generally at 11:00 p.m. In July and August of 2010, the surveyors covered 2,620 km (1628 mi) by snowmobile to take measurements at 1,030 separate points. The teams surveyed 380 km (236 mi) of profiles in 26 days, collecting points at intervals of 500 m (1640 ft) on longitudinal profiles. The intervals between points on transverse profiles ranged from 40 to 400 m (130-1312 ft). 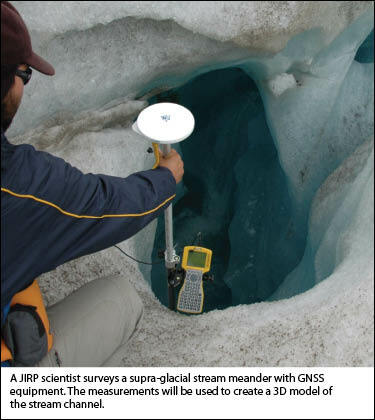 An additional 4,650 points were collected in continuous topo mode to contour supra-glacial streams (meltwater streams on the surface of the ice). The points surveyed in 2010 were added to the existing database of surveyed points, which comprises GPS/GNSS surveys over a 19-year period from 1992 to 2010. The database now contains approximately 5,500 discrete stakeout points and around 32,000 surveyed coordinates. Filmmaker Chip Duncan and his assistant, University of Alaska Southeast webmaster John French (Frenchy), made a surprise visit to the JIRP 2010 summer program. The two have been working on a PBS documentary titled The Life and Death of Glaciers and spent three days with the JIRP researchers, filming the digging of a test pit and the GNSS measurements on that profile; they also interviewed students and scientists, including one professor whose first JIRP expedition was in 1969. The PBS special is scheduled to air in 2011. Collecting the data was just the first step. It was then necessary to analyze it to understand the dynamics of the icefield. This analysis typically focuses on several areas: glacier velocity and direction, surface height change, surface strain rates, isostatic rebound of the Earth’s crust, and movement due to plate tectonics. Determining glacier velocity and direction is accomplished by performing two surveys at each of the points of a profile. The observed coordinates of the Epoch 0 and Epoch 1 surveys are then compared with each other, and simple trigonometry determines the distance and direction that the glacier moved. While the JIRP survey data typically is focused on the glaciers themselves, other data analyses can reveal changes in the Earth’s crust. As a glacier melts, its mass decreases and the Earth’s crust can rise, resulting in post-glacial crustal uplift. For this analysis, the multi-day static data from the base stations is evaluated. As part of this work, the base station’s coordinates are transformed into the International Terrestrial Reference Frame. By tying the data to permanent stations provided by International GNSS Service, researchers can compile a time series of coordinates and determine both horizontal and vertical displacements of the bedrock upon which the benchmarks are located. Surveys thus far reveal an uplift rate of 0.9 to 1.1 cm per year. A key part of the summer’s work involved the German high-resolution radar satellite TerraSAR-X (provided courtesy of Astrium GEO-Information Services - Infoterra GmbH), which in combination with its “twin” TanDEM-X is collecting data to create a global DEM of unprecedented accuracy, quality, and coverage. This unique dataset will feature a relative vertical accuracy of 2 m (absolute accuracy 10 m) within a 12 x 12 m horizontal “pixel” and will be available for the entire land surface of the Earth from 2014 onwards. Initially used in 2009, TerraSAR-X generated a radargrammetry DEM for the research areas in the icefield; the DEM has been validated with the 2009 GPS results determined by JIRP. For further investigation and development of SAR applications in glacial regions, other ground-truth measurements using satellite corner reflectors were conducted in 2010. The two 28 kg (60 lb each) devices that Wenzel brought to the icefield were designed to reflect the radar beam back to the satellite. The results were used for backscatter analysis in areas with permanent snow and ice coverage, for change detection research, and for validation of ground-control point extraction. Wenzel set the corner reflectors up in different locations and at different times to capture a number of satellite overhead passes. He used GNSS to measure the elevation of the corner reflector’s centerpoint with centimeter precision. As the TerraSAR-X satellite passed overhead it recorded the 3D position of the corner reflector from space; the position was later compared with the ground measurements taken with GNSS receivers. The use of corner reflectors for glacial research in combination with data acquired by TerraSAR-X was a JIRP first and an important success. The RTK position of the corner reflectors provided a high-accuracy link between the data provided by the radar satellite and ground-based observations. Radar satellite imagery can provide a valuable enhancement to monitoring and detecting changes in non-accessible icefield regions. The efficiency of the GPS/GNSS equipment allowed the teams to overcome their initial eight-day weather delay in 2010 (25% of available measuring time) and expand the surveys to include 50 km (31 mi) of new profiles. The expanded areas included the upper accumulation zones of Taku Glacier (the icefield’s largest glacier) and the Llewellyn Glacier in British Columbia. While the Taku Glacier is one of the few advancing glaciers in Alaska, the Llewellyn Glacier in the northeast sector of the icefield shows an alarming loss of mass; the Llewellyn has contracted by about one third (approximately 10 square km or 3.9 square mi) between 1984 and 2010. “There is still much research to be done,” Wenzel says. “The glaciers on the drier Canadian side of the icefield show a larger magnitude of thinning than the Taku Glacier.” Researchers want to concentrate their efforts there, combining historic data with the newer GPS/GNSS data, while also incorporating sensors such as a fully automated meteorological station and electronic stream gauges. For more information on JIRP visit www.juneauicefield.com and www.crevassezone.org. Sinning Vermessungsgeräte GmbH and Trimble Germany generously supported the 2010 JIRP field season by providing Trimble GNSS equipment. Kris Carber is a writer living in northern California.